For customers who would like to emboss your name or initials into the padfolio, please make sure "Custom" is selected when you place your order. Just let us know your idea. We will make it for you. Click 'Add to Cart' to order the best business portfolio right away. ★GENUINE LEATHER MATERIAL - This portfolio is made of high quality genuine goatskin leather, will complete a sleek minimalist business look. 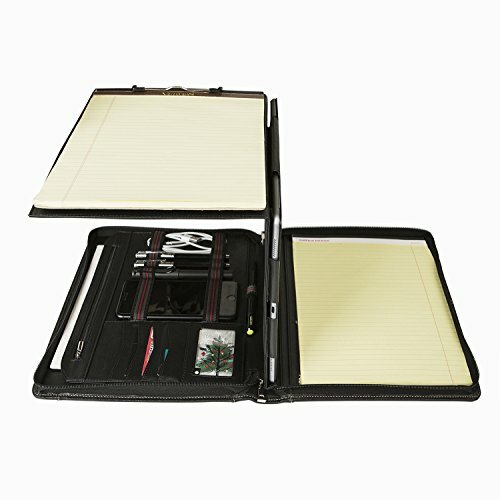 ★SPECIAL FOLDING PANEL DESIGN - Features folding center panel including a wring pad with paper clip on the left side and a tablet holder/case on the right side, can be used as a stand for your tablet when work and folded to save space. If you have any questions about this product by Hifriend, contact us by completing and submitting the form below. If you are looking for a specif part number, please include it with your message.